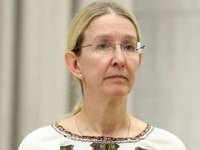 Acting Health Minister of Ukraine Ulana Suprun, speaking in the Straight Talk program on the air of Channel Five, has explained how health care financing would grow and why, in her opinion, it's not worth being afraid of reforms in this area. "Those who are afraid, I think, do not understand how it will change. There are a lot of myths that are being spread both by mass media and those who are against the reform. But when we manage to make it clear for all the doctors what it will look like, I think they will not be afraid anymore," the minister said. According to Suprun, there appeared many opponents of the reform in the country, and a lot of myths have accumulated, which must be debunked to demonstrate the effectiveness of the measures taken. The amount of funding for the sphere will also grow. The funding will be increased from UAH 25 billion to UAH 85 billion from 2017 to 2020.